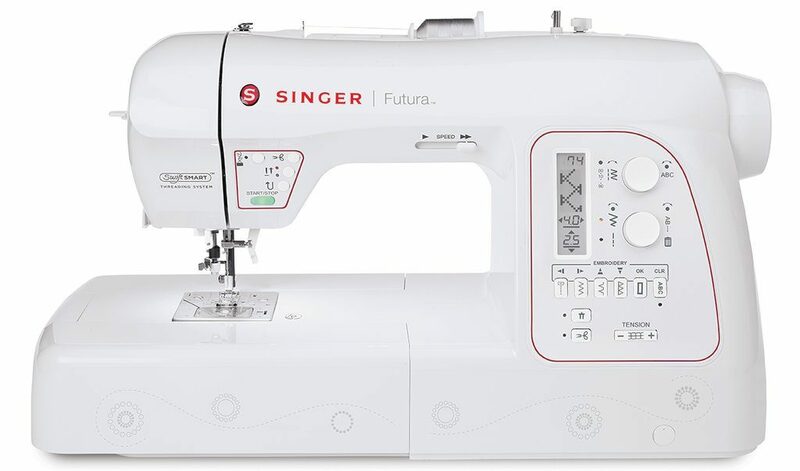 A high-end combination (sewing and embroidery) machine, Singer’s Futura XL-580 promises a lot. This is a modern, computerized machine, packed with exceptional features, made to be suitable for beginners and experienced sewers both. One thing is for sure – this is a clear sign of Singer’s ambition. Have they come through on their vision? 2 in 1 machines are usually harder to pull off, even aesthetically, but at least in that department Singer have done their job properly. The Futura XL-580 looks unique and it is beautiful. A minimalistic color scheme, sleek oval lines and a modern look is what Singer has clearly been aiming for and they have most certainly delivered. The heavy-duty metal frame is one of the highlights of this model, making it a sturdy, stable piece of machinery. Singer Futura XL-580 is a fully computerized machine that’s made to cater to the user, while allowing them to experience all its highlights easily and without too much effort. Obviously, the machine can be easily connected to a computer or a laptop and designs can be imported via the USB port. If you’re an intermediate user, you’ll love the AutoPunch software that’s included in the machine – it allows you to convert images to embroidery instantly. 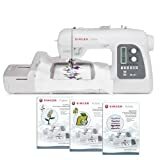 The XL-580 comes with 250 built-in embroidery design and 215 sewing stitches, as well as 20 alphabet fonts, which is plenty even for experienced users, let alone beginners. The XL-580 also comes with a clear cover, designed to help the user see the bobbin supply. The embroidery hoop is huge – 10×16 inches, which is wider than any model we’ve ever reviewed before and this is certainly an aspect in which Singer have outdone themselves and the competition. However, even though the maximum hoop size is 10×16 inches, the hoop can be adjusted and thanks to the XL-580’s multi-hoop capability, users can embroider designs of up to 18.5 x 11 inches. Three hoops of different size are included: 10 x 6″, 4 x 4″ and 6.75 x 4″. Thanks to the wide surface there is no need to fold the fabric – you can access the designs you’re working on easily and from different angles, which also makes this a great machine for quilting. Curtains, towels, napkins or couch covers can easily be sewn or embellished thanks to the wide surface area. Overall, when it comes to design and functionality, one would have to look hard to find a flaw. We have and we haven’t found one. But is the performance as spectacular as the design? When it comes to performance, the XL-500 does very well, as a sewing and as an embroidery machine both, but there is an unusual issue we have encountered – the tension system. It can sometimes be hard to adjust, which can lead to needles breaking. This is about the only flaw of this model, but perhaps not big enough of a flaw to be a deal-breaker. Still, a bit of a disappointment. The professional, high-end dimension of the XL-580 shines through, especially when one looks at functions such as the knee lifter or the multi-hoop capacity. This enables the user to sew for longer periods of tie, without any discomfort. This is the reason many home-based business owners love this machine, as it allows them to work at their designs for hours at time. The XL-580 might be a professional model, but it is extremely simple to use. This makes it great for beginners too, who shouldn’t have a hard time adjusting to the machine’s extended and seemingly complicated features. The automatic needle threader is the perfect example of this – all the user must do is touch the LCD screen and the thread will automatically inch through the eye of the needle. When sewing, swiping the fingers across the LCD screen automatically adjusts the machine’s tension settings. On top of that, the LCD screen can be used to adjust the needle position (which means you can use it for pivoting or appliques, for example). One of the best features of the XL-580, when it comes to performance, is the automatic bobbing thread pick-up, which works great, speeds up and simplifies the sewing process. The work area is equipped with six LED lights, which means you can sew or embroider designs even at night, because the LED lights brightly light the area. 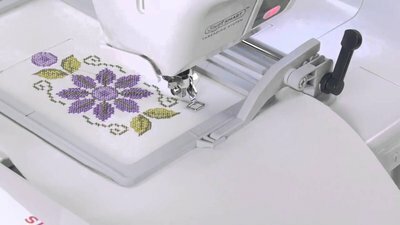 The automatic thread cutter works great for ensuring comfort, at the same time enabling the user to make clean cuts to the bottom and the top thread simultaneously. The XL-580 also comes with a knee lifter, which makes things even more convenient – the machine can practically sew hands-free, while your hands are busy focusing on quilting, appliqueing or embroidering. 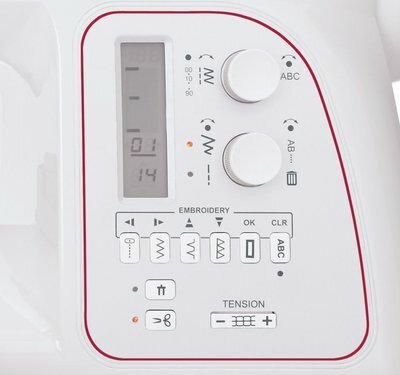 Thanks to its wide variety of features and functions, the XL-580 is perfect for embroidery and sewing too and perhaps a great investment for those of you looking to turn their hobby into a full-blown home business. One of the best things about it is the price – it may not be the cheapest model on the market, but it is most certainly worth the money. If not for those issues with the tension system, it would have been close to perfect.